Did you get a foreign body stuck in your eye, such as sand, metal, wood, chemicals, or pretty much anything? 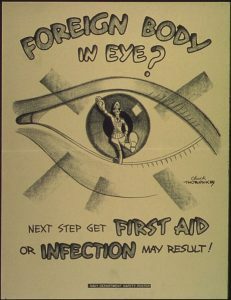 Is your eye crusted over, infected, and oozing fluid? Are you suddenly seeing spots, floaters, or distortions in your field of vision when you weren’t before? Dr. Ely of All Eyes Vision Care is the go-to optometrist to treat eye emergencies in Clarksville, TN. Whether it’s an eye infection (such as pink eye); a cut, scratched or bleeding eye; chemical exposure; or sudden floaters ― Dr. Ely has the tools, skills, and experience to diagnose and treat eye emergencies accurately and effectively. We remove metal and other foreign bodies, we treat blunt trauma, sudden floaters and we test for and treat red eye (pink eye) quickly and easily. We also treat sudden and severe flare-ups of allergies and dry eye. We have specialized equipment, including a slit lamp and microscope as well as highly-effective special lab tests for pink eye and dry eye. Combined with years of experience specifically in treating eye emergencies, we are able to diagnose and treat the condition with better accuracy and effectiveness. 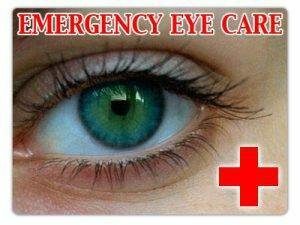 If you have any eye emergency whatsoever, we will make sure that you are seen and treated as quickly as possible. Contact us now. If you experience any of these symptoms, contact us immediately. Many types of eye emergencies require urgent attention – so don’t delay! Many people aren’t sure whether to call an eye doctor or to wait and see if their eye condition resolves itself. When in doubt, it’s always best to reach out and ask your eye care specialist. Eyes are delicate, and it’s not taking a chance and risking your vision. What are common reasons to seek emergency eye care? If you experience any of the above, our optometrist is qualified and experienced in restoring your comfortable, healthy vision. Do not delay – call us immediately in order to prevent possible eye complications or future vision loss. What are the symptoms that I need an urgent eye exam? If you experience trauma or injury to your eyes, our eye doctor is here to help. With first-rate diagnostic equipment and specialized tools, Dr. Lisa Ely will evaluate your condition and provide emergency eye care treatment. She will check the front surface of your eye thoroughly, as well as perform a digital scan to inspect your inner eye tissues, when necessary. You don’t always need to rush to the hospital and wait on long lines in the emergency room – if you need urgent eye care, call our Clarksville, TN, for guidance! When something gets lodged in your eye, you’ll feel irritation that ranges from mild to severe, depending upon what the object is. Even a stray eyelash will cause discomfort. Mild irritations often resolve by themselves, with no intervention and no long-term complications. However, depending upon how the object entered your eye, treatment may be needed in order to prevent lasting vision problems. If a few hours pass and you still feel pain, contact us for assistance. If you suspect that the foreign body pierced the outer layer of your eye, immediate medical treatment is critical! It may be dangerous to wait, and rapid action can help prevent vision loss, premature cataracts, and retinal damage. Immediately after your eye is exposed to a foreign body, blood vessels in your eye will dilate. Your eyelids, cornea and conjunctiva may become inflamed. If the offensive object isn’t removed quickly, your risk of infection rises. Eyes are extremely sensitive and delicate, and your persistent attempts to remove the object may cause further damage. Dr. Lisa Ely, will generally insert numbing eye drops before attempting to remove the object with specialized tools, especially when a simple eye rinse doesn’t do the job effectively. It’s critical to seek help from a trained eye care professional; visit our office in Clarksville, TN for assistance. What happens when a foreign object gets stuck in my eye? Many objects that seem small and harmless can irritate or cause damage to your eyes. Foreign bodies that can easily get stuck in your eye include: a grain of sand, particle of dirt, sawdust or splinter of wood, metal shaving, tiny insect or even a stray eyelash. When any of these items becomes lodged in your eye or under your eyelid, the blood vessels of your eye will dilate almost immediately. Your conjunctiva (mucous membrane that coats the eye surface), eyelids and cornea may swell. The longer the offensive object stays in your eye, the higher your chance of developing an eye infection or complication. How can I safely remove a foreign objects that is stuck in my eye? If these tips do not help, you will require emergency eye care in our Clarksville, TN, clinic. Keep in mind that persistent attempts to remove an object from your eye will typically irritate your sensitive tissues further. Contact us immediately for assistance. What should I do if the foreign object pierced my eye? Do not attempt to remove the object on your own, and do not apply any pressure to your eye! 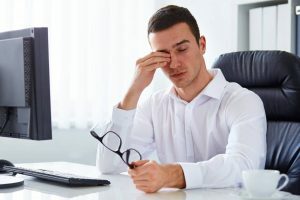 If you suspect that something penetrated the outer layer of your eye – it is critical to go for immediate medical treatment from a professional. Waiting to receive treatment can put you at risk of vision loss, retinal damage, and premature cataracts. After assessing the condition, your eye doctor will usually insert anesthetic eye drops before extracting the object with specialized tools. We are competent and experienced in a wide range of eye emergencies. Contact Dr. Lisa Ely in our Clarksville, TN, office for assistance. What should I do when a chemical substance gets in my eye? Even solutions that are helpful for skin can irritate your eyes, such as sunscreen and facial cleansers. Unfortunately, it’s very easy and common for people to accidentally rub these chemical substances (and more hazardous solutions) in their eyes. In case of eye contact with chemicals, rinse your eye out immediately with clean, cool water. Hold your eyelid open and place it under running water for about 15 minutes. If you need to flush out both eyes, standing under the shower head is most efficient. Afterwards, call our Clarksville eye doctor to find out if additional treatment is required; be sure to tell us exactly what solution irritated your eye.